Kappeler’s entire library of books on the Science of Christian Science are available on this website. You can download free electronic copies (pdf) or purchase books. Reading Kappeler’s books is the core study of Science. If you are new to Kappeler’s work, we recommend the Progressive Study Program. 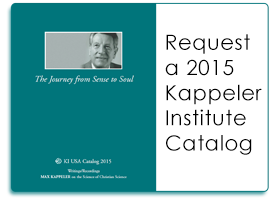 It will suggest Kappeler’s key books—and associated recorded classes, if you want to go more in depth on a particular subject. All of Kappeler’s electronic books are in pdf format, and can be downloaded directly to your computer/device. It is possible to read them using a web browser, but we recommeded that you save books to your device before reading, as it will allow you to use the full functionality of your pdf reader software.